The “Future Library” Project in Oslo, Norway has taken root in 2014 as a unique, hundred-year “living, breathing” public art project. 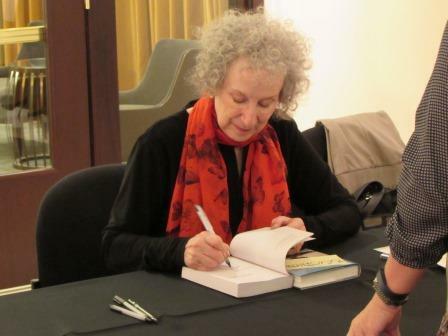 Margaret Atwood, a fervent environmentalist and author of over 40 works, has been chosen to contribute the first manuscript to this imaginative collection. Too bad we won’t be able to read her book in our life time. Scottish artist Katie Paterson conceived the ambitious idea as part of a series of public art projects commissioned in Norway. The core idea is of a “literary time capsule” imagined on multiple levels. One author a year will be invited to contribute a new manuscript written for the project. Part of the agreement is that the work must be new, unpublished, and secret. Only the title of the work will be known. The printed text will be sealed in a box. The works will not be opened and read for a hundred years, or 2114. Paterson has taken over a plot of land outside Oslo Norway. She then planted 1,000 trees. These trees are to be protected and allowed to grow for 100 years. Then they will be cut down and used for paper to print copies of the 100-book collection. Her core imagery for the project is a cross-section of a tree, with 100 tree rings (OK, I didn’t count each one) emanating from the “2014” beginning year in the middle. But what if the technology to print books no longer exists in a hundred years? Paterson has thought that through as well. A printing press will be included in a sealed room. A special room dedicated to the project is scheduled to open in 2018 in a new public library being built in Oslo. The room will be designed by the artist, and lined with wood from the trees that were cut down to make way for the 1,000 young saplings. Author names and titles will be displayed so visitors can contemplate and wonder about the contents. But only future generations will have access to the manuscripts. I first heard about the project from Margaret Atwood, when she spoke in Phoenix. She’s very honored to be the first contributor. The 74-year-old author sees the project as hopeful that in a hundred years a) our planet and humans will still exist, b) they will still be readers, and c) will know the printed word. I hope so too. “A forest is growing in Norway. In 100 years it will become an anthology of books.” – Katie Paterson. What a fascinating concept! Like a time capsule – on steroids. Thanks for posting this.